Salzburg – even the name of the town echoes like music. The Salzburg Festival, Salzburg Organ Concerts, Salzburg Palace Concerts in the Mirabellengarten – over 400 music and theatre performances a year have rightly given Mozart´s birthplace the title “The World´s Stage”. With a population of 150,000, Salzburg has kept the charm of old tradition combined with city flair throughout its changing history. In a relatively small area you seldom find a more attractive neighbourhood of scenery and architecture or tradition and innovation. Salzburg´s old town is remarkably well preserved and was declared a World Heritage Site in 1997. Medieval and Baroque architecture blends into an organism which is still alive today. 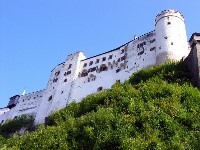 The Hohensalzburg Fortress dominates towers and domes of many churches. Fine town houses with decorative facades line the maze of narrow streets such as the Getreidegasse or the Linzergasse. In light of the relatively small area and the mass of tourists, going into the millions, the services our Limousine & sedan Service provides are becoming more and more important. Users of our Limousine Service Salzburg no longer have to worry about driving and parking restrictions, obstructions, regulations or fines imposed on you. They don´t have to concentrate on the traffic signs or fit their sightseeing programme in around parking times. Carefully chosen, well-qualified chauffeurs ensure that Salzburg is a pleasant, stress-free experience. Their knowledge of the city, together with insider information guarantees you a smooth transfer from the airport to your hotel. We, at Sedan & Limousine Service Salzburg, pride ourselves on our polite and courteous service. Even the districts where only vehicles with Austrian number plates are allowed to drive are open to those using the services of our Limousine Service Salzburg. When the weather is bad, a special traffic regulation is in force. Then the police direct the traffic to a compulsory Park and Ride area. Your further journey could be extremely pleasant for you – driving in one of our Limousine & Sedan Service Salzburg´s extravagant limousines, instead of being packed in an overcrowded bus. Our Chauffeur Service & Limousine Service can offer sightseeing tours to the most beautiful places in the town and the surrounding area, just as you wish. Nothing is predetermined. You yourself decide where you want to go and how long you want to stay. Our Sedan & Limousine Service Salzburg provides elegant, comfortable and safe vehicles for all our services, whether a transfer to a concert or theatre, a trip down the salt mine or to a festival. As our valued VIP guest you will have that superior feeling of not having to wait with the masses at the taxi rank or to trouble yourself with public transport. Of course, in addition to Salzburg, our Chauffeur Service and Limousine Service is also available in Innsbruck and Vienna, as well as all ski resorts in Austria, for example Kitzbühel, Lech am Arlberg, Ischgl Sölden and many more. In fact, transfers from Munich Airport (MUC) towards the alps are often very popular with our Russian guests, as Bavaria Limousines has Russian speaking chauffeurs, as well as chauffeurs speaking many other languages. Your Chauffeur Service & Limousine Service, Bavaria Limousines / Office Salzburg, Austria.